An affidavit form is the one that helps you to assure the legitimacy of any declaration or claim. Whether you are looking to sponsor a student or certify your citizenship while applying for a passport or have to legally certify your marriage and spouse- you would need to do that through affidavit forms. The notaries and lawyers are entrusted with the duty to draft affidavit form and to help them there are several pre-designed Affidavit Forms online. 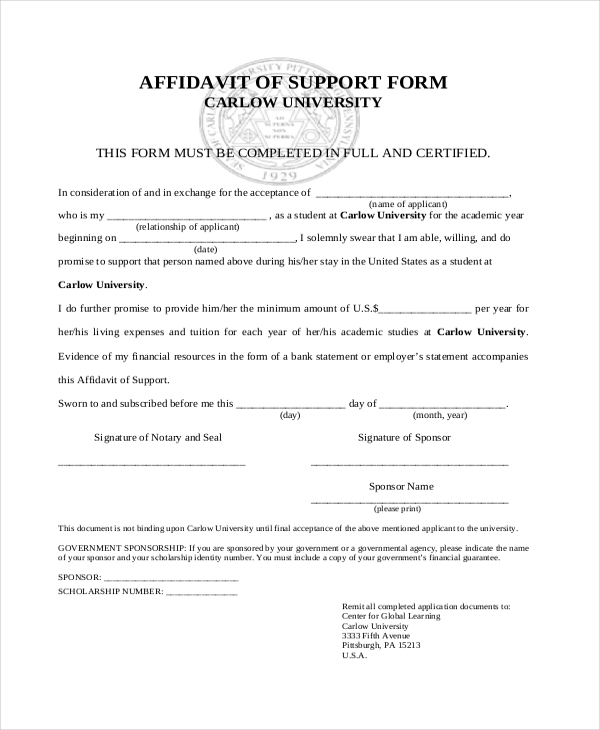 This affidavit form is to be filled by a sponsor who wishes to certify legally that he is willing to sponsor the university education of a student. The form will also contain information about the exact amount that he will sponsor. 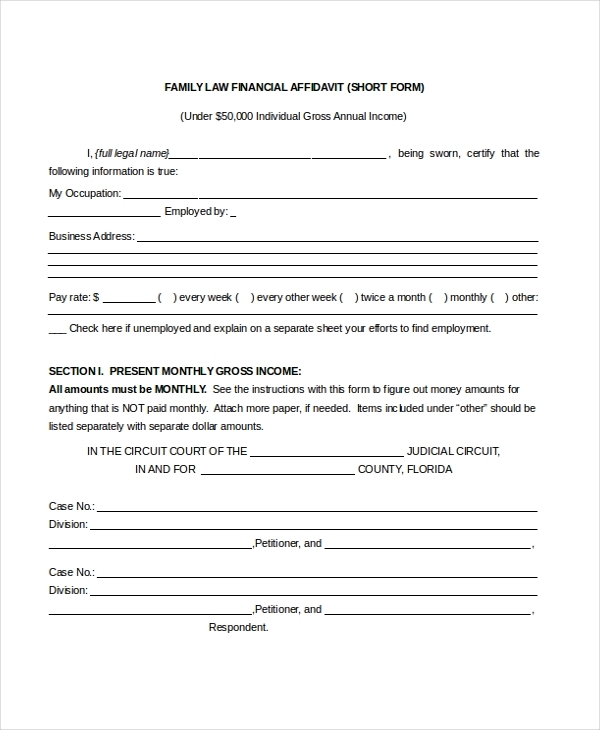 You have a financial affidavit form here which allows space to legally declare your financial situation. There are sections on monthly income, monthly deductions, monthly expenses, assets and liabilities and so on. 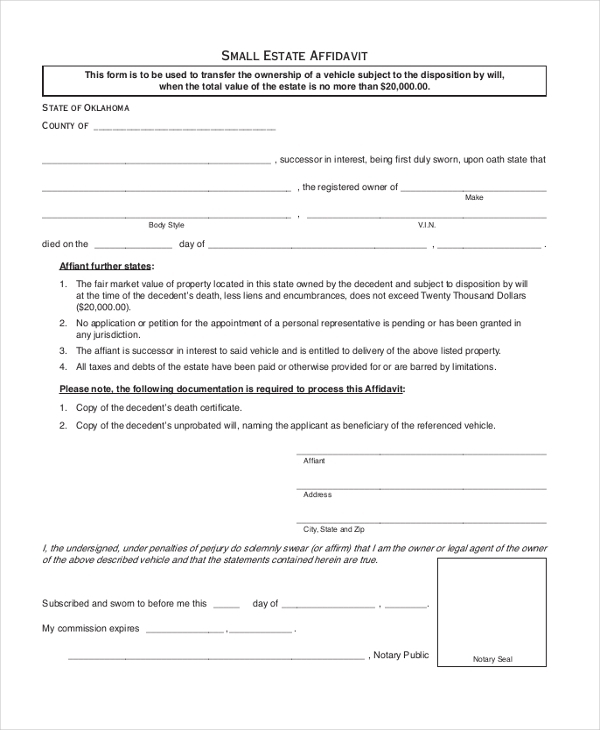 This small estate affidavit form here would be offered by motor vehicle division when a vehicle ownership is being transferred on the death of the actual car owner. 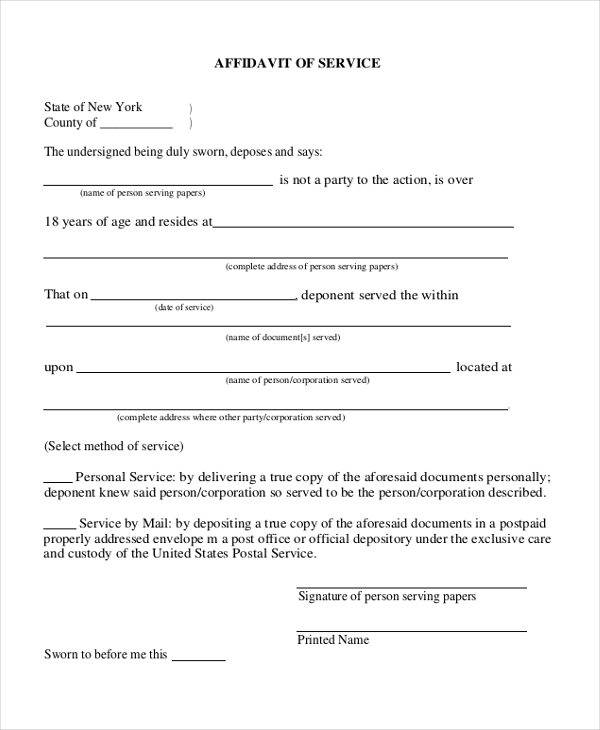 The form states which documents are required to process the affidavit. 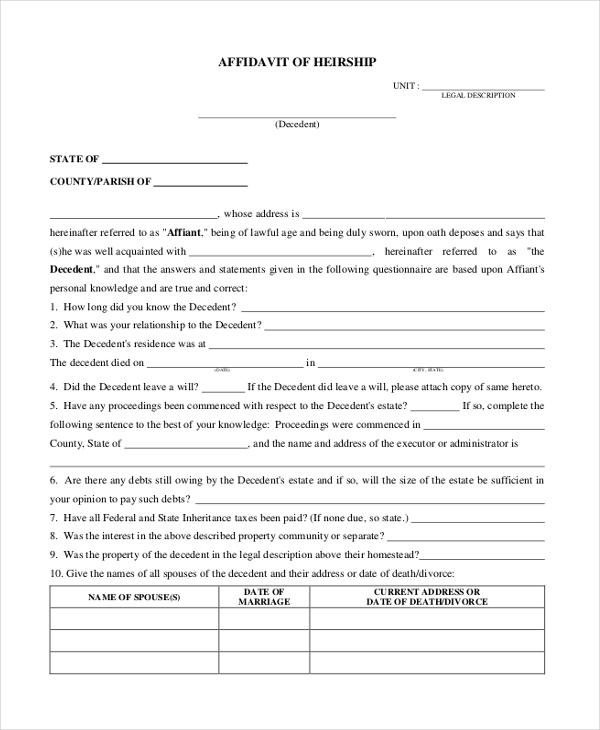 You have an affidavit of heirship form here where the affiant declares that he used to know the decedent and the form also hosts questions to understand in detail how well the affiant know the deceased person. You have a blank general affidavit form here which begins with a certification from the notary that the affiant has claimed that all his statements in the form are true. Below you have a huge space where the affiant would place his information. 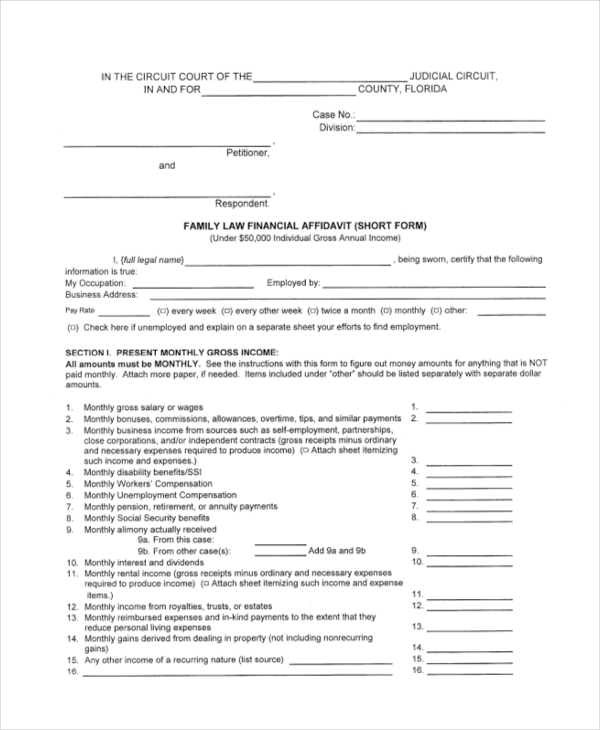 If you are looking to file a financial affidavit when you have to show that your gross income is below 50,000 USD a year in regards to a family law case, this form would be really useful. 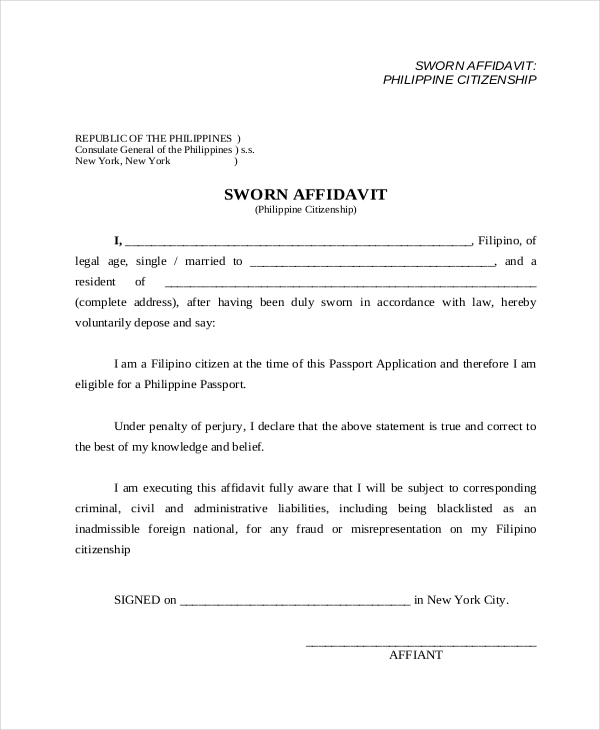 This form would be extended by Consulate General of Philippines when a person has to legally certify the citizenship while applying for the passport. The form also declares that the affiant is well aware of the consequences in case his statements are proved to be false. 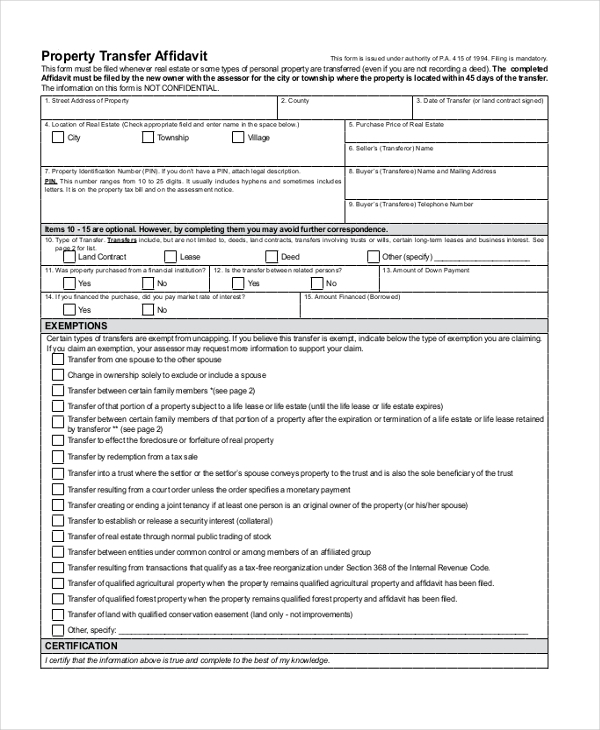 You have a standard affidavit of service form here where the affiant declares that he is not a party to the action and that he has served the needed documents at a specified address. 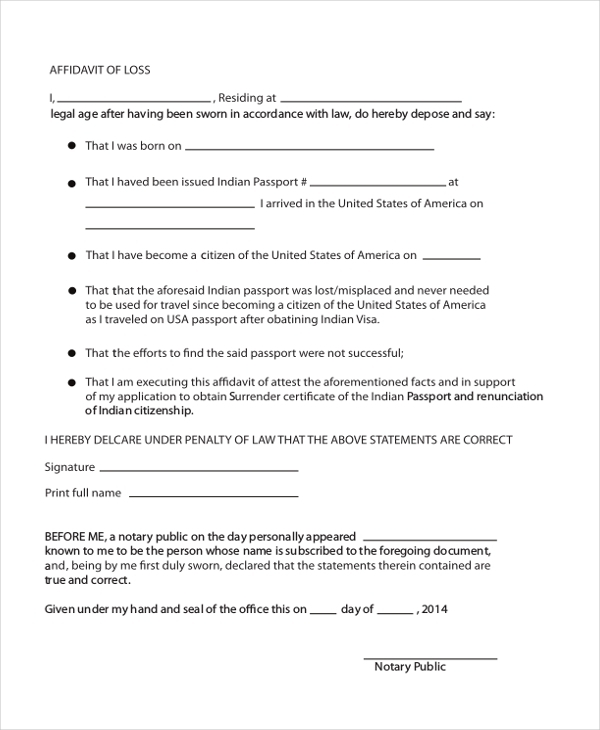 This affidavit of loss form would be useful when a person of Indian native, who is a US citizen now and has lost his Indian passport. The form also states that the efforts invested in finding the passport were not successful. 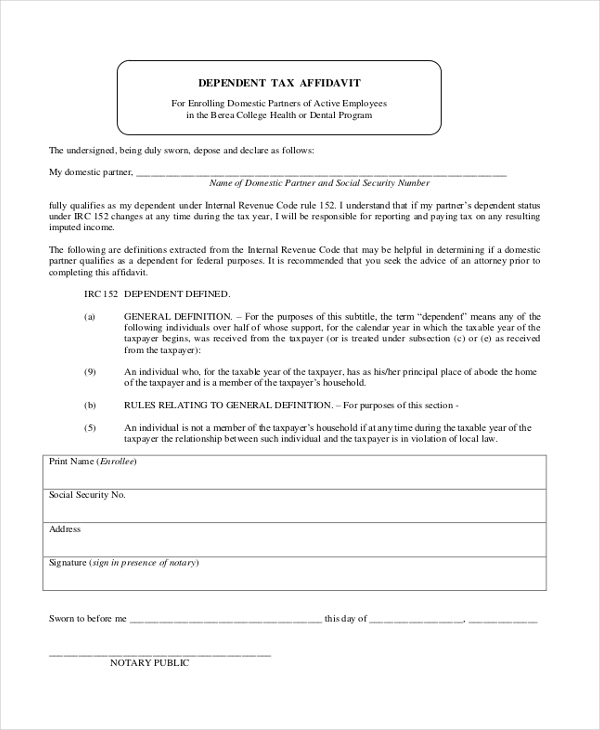 This affidavit form would be extended by the State Treasury Department when a property is being transferred and the form is to be filled by the new owner. The form includes information on the property, the transfer, and exemptions. 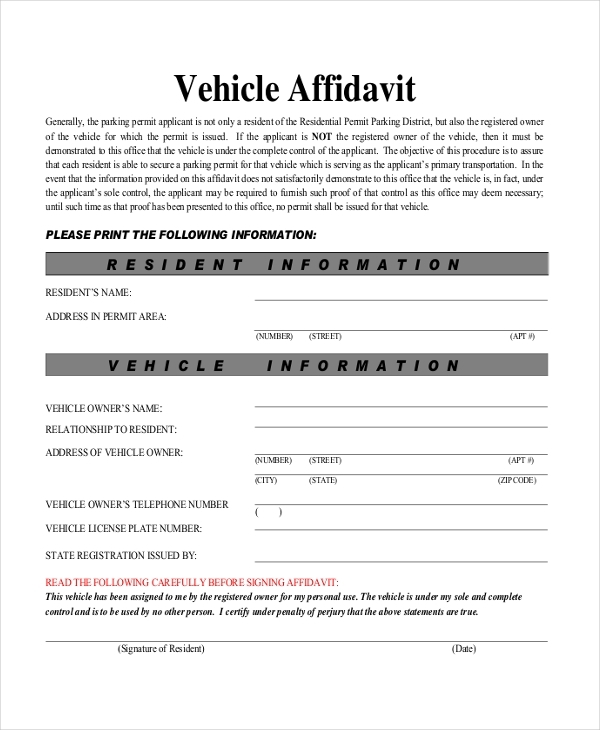 This vehicle affidavit form would be handy when a person who is not the registered owner of the vehicle has to establish legally that the vehicle is under his complete control. 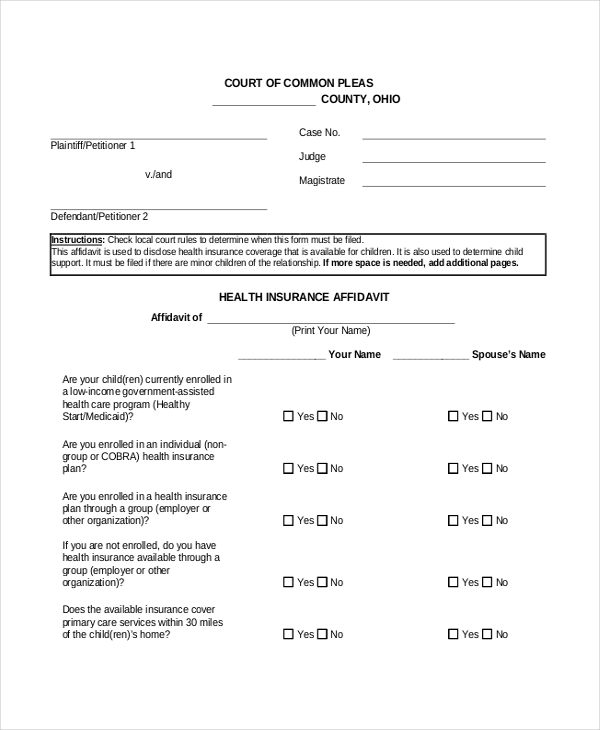 You have a health affidavit form here which would be needed to declare the health insurance coverage and child support available for kids. The form is to be extended by Court of Common Pleas. 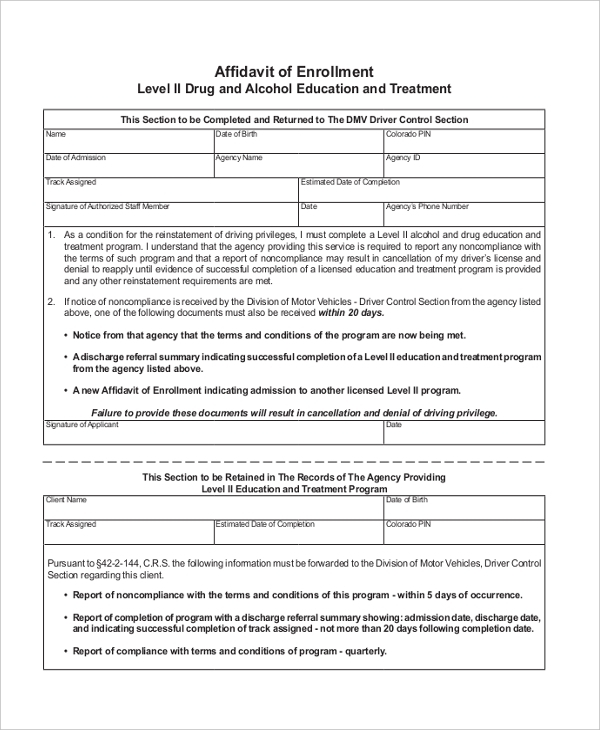 This affidavit form is to be extended by the Department of Motor Vehicles where the affiant wants to declare legally that he would complete a Level II alcohol and drug education and treatment program. 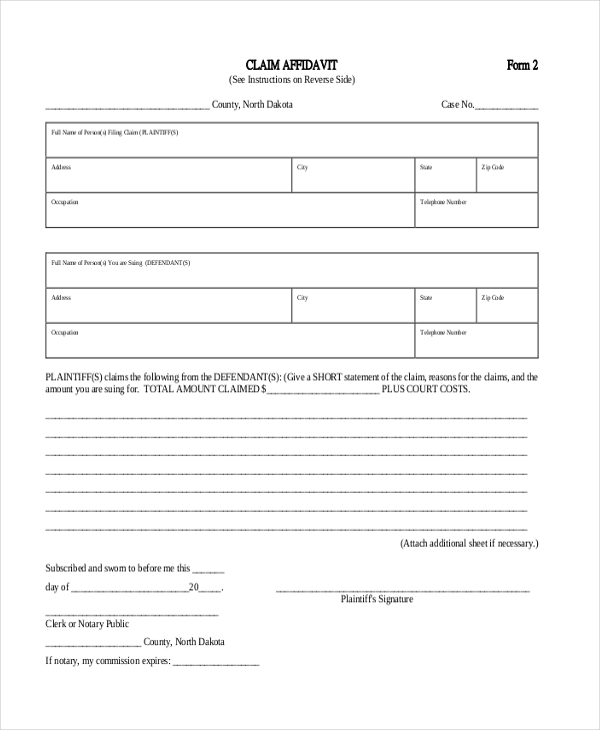 You are getting a standard sample of dependent tax affidavit form here which would be useful to enroll domestic partners of active employees in a health or dental program. The form also states that the affiant is ready to take the responsibility in case the partner’s dependent status changes. This claim affidavit form begins with personal and contact information of the plaintiff and defendant and then is further followed by space to note in brief about the claims being made. What is The Purpose of Affidavit Form? The main purpose of affidavit form is to certify a declaration legally. It could be the announcement of offering financial support to a student for higher education or an acknowledgment of marriage or declaration of transfer of property ownership or a dependent tax affidavit. An affidavit form signed by notary shows that whatever you have placed in the form is completely legit and no one can deny the claim here. In most of the cases, without the affidavit form, no claim or declaration is to be considered valid. Then, the form also acts an evidence that the affiant has himself or herself agreed to meet the consequences in case the facts declared in the form are found to be false. You can also see General Affidavit Forms. The affidavit form would be needed by anybody looking to make a claim legally. Whether you are looking to change the name or transfer the property or have to announce the loss of a valuable, say passport- you would require the affidavit form. These forms are extended by courts, notaries, and lawyers or legal firms. If it’s something related to property, then the form is offered by the Treasury Department. On the other hand, if it’s something related to the vehicle, the form would be given by the Motor Vehicle Department. These days you have readymade affidavit form templates so that you don’t have to draft the whole thing from scratch. 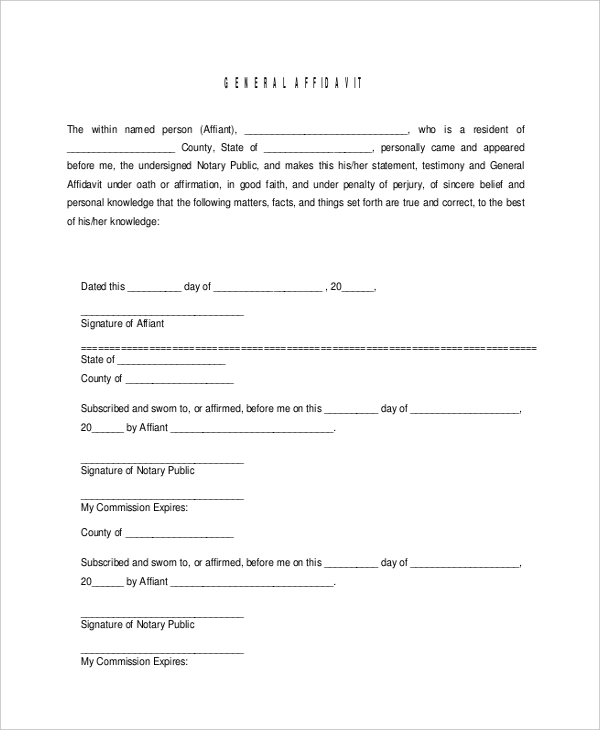 You may also see Small Estate Affidavit Forms. If you need ideas on how to frame affidavit forms, the form samples mentioned above would be the thing for you. This affidavit of service forms are all designed by experts and hence you can expect a standard structure here. You would just have to download and customize them with your affiant’s data.